A day after announcing an abrupt departure of its CEO, First Solar (s FSLR) has some good news that is helping to stem the rapid dive of its stock. The solar panel maker on Wednesday said it’s boosted both sales and profit for the third quarter, and will also cut costs as it moves into 2012. The company’s shares rose nearly 14 percent to reach $49.20 per share in recent trading, a reversal from the 26-percent drop from Tuesday, when it said its chief executive for two years, Robert Gillette, had left his post effective immediately and was replaced with interim CEO Mike Ahearn, who spent nearly a decade building First Solar into a successful public company before he stepped down in Sept. 2009. The company also said Tuesday it wouldn’t release the third-quarter financial results until next Thursday. The terse announcement and the prospect of a week’s wait to hear the reason for Gillette’s ouster and company’s future plans fueled speculations and pummeled its shares. The news that Ahearn will helm the company until it finds a permanent replacement didn’t really help to calm anxiety. Although First Solar has now released the financial results earlier, it still plans to discuss them next Thursday. So let’s look at how it fared in the third quarter: Sales rose 26 percent year-over-year to reach just over $1 billion, and the company also doubled its sales in the second quarter. Net income rose 11 percent year-over-year to reach $176.9 million, or $2.25 per share, which is a dramatic improvement from the second-quarter net income of $61.1 million, or $0.70 per share. The third-quarter financial results corresponded with the rosier outlook Gillette gave back in August, when he discussed the terrible second-quarter earnings. He said the company was “positioned for a better second half.” But the company has cut its 2011 earnings expectation to $6.50-$7.50 per share, down from the $9-$9.50 per share it issued in August. Sales for the year should reach $3-$3.3 billion instead of $3.6-$3.7 billion. As an industry bellwether, First Solar’s performance gives a good indicator of the health of the overall solar industry. The company is among the top solar panel manufacturer in the world, and because it uses cadmium-telluride instead of the more popular silicon, it also is the largest thin-film solar panel manufacturer. Thin films refer to the use of non-silicon materials that create much thinner solar panels. Although First Solar has long enjoyed the reputation for being the low-cost manufacturing leader, its position is increasingly threatened with the rapid falling prices of silicon solar panels. The price declines have been particularly dramatic this year (30-40 percent) because changes to solar incentives in Europe and still weak economy prompted project developers to delay installations and caused a pile up of several gigawatts of solar panels in warehouses. The low selling prices for silicon panels, around $1.10 per watt in some instances, indicated that some manufacturers have been selling at a loss. Many companies have suffered huge profit declines, shrunk production and laid off employees. Some, like Solyndra and Evergreen Solar, have filed for bankruptcy. Others, like SolarWorld, are taking on Chinese manufacturers by filing anti-dumping complaints, which accuse the Chinese manufacturers of flooding the market with panels at below-market prices. Europe, in particular Germany and Italy, has been the largest solar market because of generous government subsidies that guarantee high solar electric prices. But the incentives are designed to fall over time as the market grows, so manufacturers are keenly aware that they need to find new markets. First Solar began talking a lot about the new markets it wanted to enter – India, Australia, Middle East, for example – a year ago. It followed up with deals in some of these countries. The company also has been active solar farm developer in North America in the past two years, a business that helps find outlets for its solar panels. 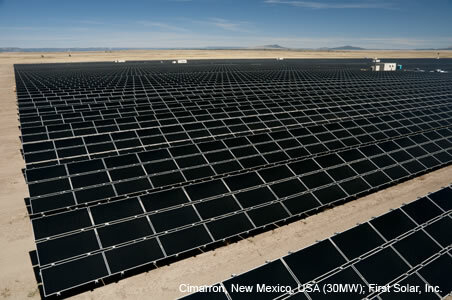 For 2012, First Solar is in the cost-cutting mode. The company said it wants to reduce capital expenditure – which would mean a scale back of investments in its factories – and boost spending in sales, marketing and research and development.